Whether you’re a hunter, a fisherman or an outdoor enthusiast the selection of wildlife embossed leather belts from Gavere Leather is sure to have a unique leather belt for you. 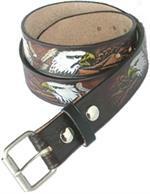 These 1 ½” top grain leather belts feature detailed wildlife and hunting scenes and a beautiful two tone leather finish. Each belt is proudly made in the USA in our High Springs, Florida facility and features our own signature sixteen step finishing process to ensure a great looking, long lasting leather belt. Buy one for yourself or give one as a gift, these handmade leather belts are a great way to show others your love of the great outdoors, or your sportsman’s pride.